So almost three years to the day (10/7/2015) Wayne had his gastric sleeve surgery. You can read all about that HERE. That procedure was the best decision he ever made for himself and even though it was a difficult road the following months after, it truly changed who he was for the better. I will forever be grateful for Dr. Tom and his team. 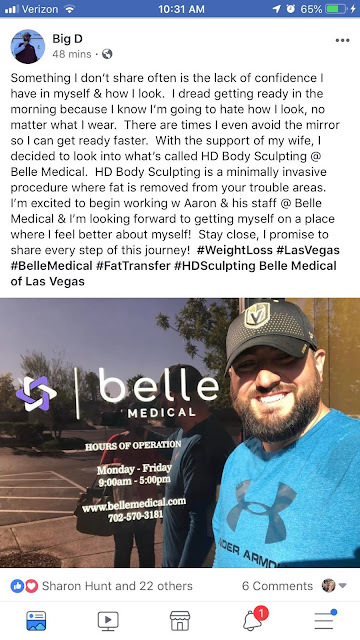 Now, today he is getting a less invasive procedure done at Belle Medical called HD Body Sculpting. He is getting his upper abdomen, lower abdomen and love handles done. With the 200 lbs he's lost since the surgery there were still a few problem areas that he wanted to take care of. Well, that's where Belle Medical steps in to help. This is what he shared on his FB about it. We will be documenting his surgery, recovery and the following weeks and months as the sculpting process continues to work it's magic. He has been very open about all his struggles with weight loss and confidence even before the gastric sleeve surgery and will continue to be open about this, too. He truly feels that if he can help even one person with whatever they are going through or feeling by sharing his story, then it is all worth the vulnerability that can be so scary. Now, let me just tell you that we have been together for 15+ years and I have loved him from the moment we met and knew shortly after we started officially dating that we were meant for each other. I have loved him at his heaviest (440+ lbs) and supported him from the get go of whatever he needed to do to feel better about himself and gain that inner self-confidence that he felt he was missing. This whole journey has been about him and being THE BEST person he can be not only for himself, but for his family. If you have ever met him, then you know he exudes confidence, but that doesn't mean that inside he is confident. There's a difference between the two and you would never know that about him. He still sees that 440+ lb guy in the mirror and struggles with that daily. It's hard to get out of that mindset when you were in it for so long. I am confident that this procedure will help him with the confidence he needs to feel the best for himself. I have always supported him in whatever he has wanted to do, because I know that he supports me now in whatever I do and that he would support me in anything that I would want to do in the future. Bottom line is: I am his biggest cheerleader. So stay tuned for more updates on his procedure in the following days, weeks and months.